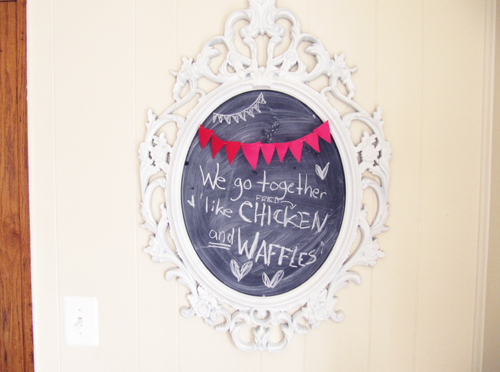 We totally go together like maple syrup and hot sauce, orange juice and champagne, chicken and waffles. 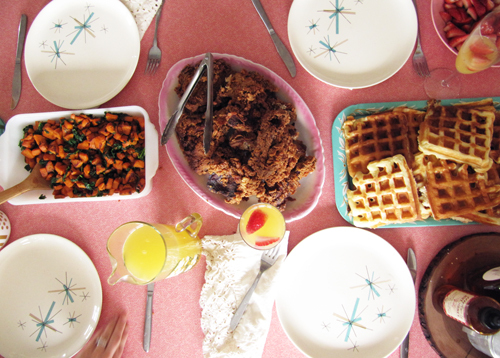 Yesterday Sunday brunch happened at home again. This time Katie and Mark came over to chicken and waffle it up. I brined the chicken the night before (my first time brining!) and fried it up that morning. It turned out tasty! I feel good about brining and frying now. I’ve always felt good about waffles. Now, listen here. These waffles are the lightest of them all! The have crispy edges and are rosemary-esque. I totally recommend them. Feel free to sweeten them up, even! Basically, I’m just super impressed with how just 4 measly egg whites are the answer! 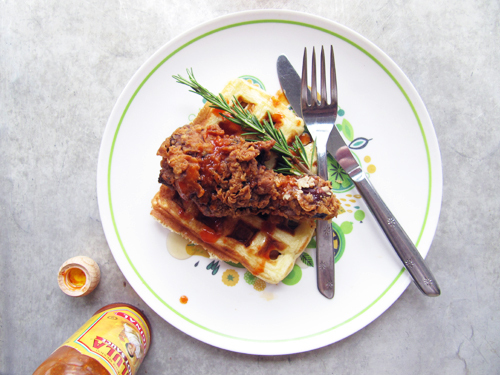 Let’s toast some fried chicken legs and then eat them on these waffles! Preheat your waffle maker. Beat egg yolks, buttermilk, milk, cake flour, baking powder, salt, oil, rosemary, and brown sugar together with an electric mixer. Beat on low until just mixed. Increase speed to high until smooth. In a small bowl beat egg whites until stiff and fold into the batter. Cook according to your Belgian waffle maker’s manufacturer’s instructions. I have this one and so about 2 cups makes all 4 waffles. Pop in a warm oven with the fried chicken until all of the chicken and waffles are cooked. Serve with spicy honey, maple syrup, hot sauce or whatever your heart desires! Katie made that dreamy sweet potato kale hash! 14 hours before it’s time to fry the chicken (the night before) stir salt into warm water. Add remaining brine ingredients. Set aside until room temperature. Submerge chicken in brine either in a large pot or a sealable bag and pop in the fridge for 12-ish hours. 2 Hours before ready to serve remove chicken from the brine and place in a large bowl. Cover with buttermilk and leave at room temperature. When ready to fry it up, whisk together the flour, old bay and pepper in a separate bowl. Heat oil in a large dutch oven until 350-370F. Frying 3 pieces at a time, remove chicken from the buttermilk, coat in flour mixture, and place in the hot oil. Cook for 10-14 minutes depending on the size of the chicken, or until they float and are nice and golden brown. Place on a baking sheet in a 200F oven until time to serve. Repeat with all the chicken until it’s all fried. Serve with waffles. Yay! Click HERE for a pdf of the recipe above. It’s true! P.S. My handwriting is the messiest! you just deserve an award or even better a PARADE! 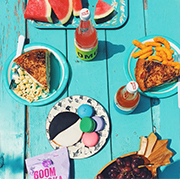 for just being the best at brunching. Also, way to handle that brining/frying situation like a champion! I knew you would! That was the best brunch ever! The best part was when the boys fell into a food coma on the floor. Solidarity means leaving no waffle left uneaten, I guess. Love YOU! And yeah man, no waffle left behind. Capricorns forever! man, those waffles sound so dreamy! I need to make those next time I’ve got a weekend breakfast or any breakfast for dinner!! Yes! You should finagle these waffles sandwich-style. 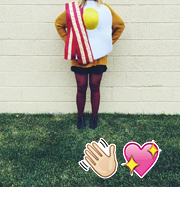 I totally wish I was your brunch guest! 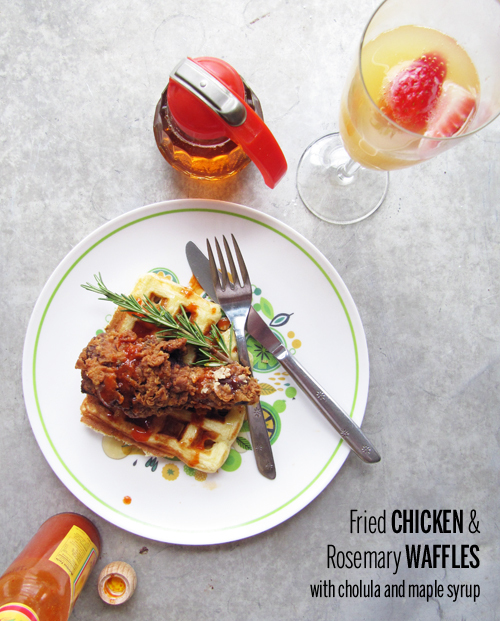 This looks amazing, and I love the idea of rosemary in the waffles! If only we were neighbz! It might sound crazy, but I tried chicken and waffles for the very first time this past weekend. I’m hooked! I seriously want to eat them all the time now. PS. Can I come live with you? Hell yes! I’m so glad you tried and loved them. Let’s be roomies! Love This!! Nothing quite like fried chicken and waffles..
That flavor combo sounds aaahmazing!! Love it. Holy moly give me now! !